Have you ever noticed that your (row) gauge is different when you work in the round? It is for most knitters, even if just slightly, and that's mainly because our tension varies between knit and purl stitches. If you're, for instance, making a Stockinette Stitch sweater with the front and back knit flat and the sleeves knit in the round, it is very likely that your row gauge for the sleeves will be different from the one for front and back. And the same goes for swatching! So when you're swatching for a new project (and you're always swatching, right? 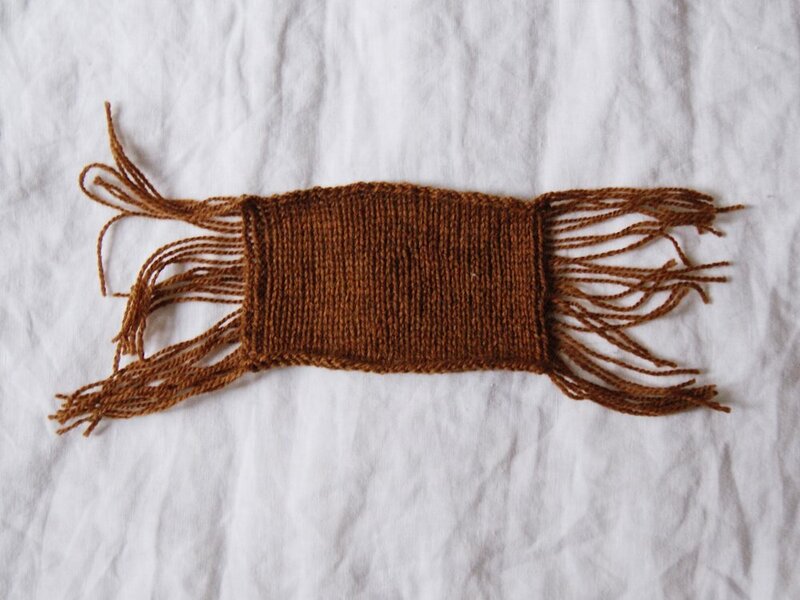 ), it's recommended, and I dare say very important, to always swatch the way the project is worked, meaning to swatch flat if your project is going to be knit flat, and to swatch in the round if your project is going to be knit in the round. Now swatching in the round might look a bit messy and intimidating, but I promise, it's a piece of cake once you've got the hang of it! Plus not having to rip back because you made a quick & dirty flat swatch and got a different gauge will be so worth it. You'll need: a circular needle with a cable length of at least 40 cm, yarn (I'm using De Rerum Natura's Ulysse in the caramel colourway, and scissors. Cast on the number of stitches needed for your swatch. I used a Longtail Cast-On here, but any cast-on suited for knitting flat will work. ... all the way over the cable until they are on the opposite end of your circular needle. ... and prepare for working the next row, keeping in mind that when swatching in the round, you always follow the right side instructions for whatever stitch pattern you use. ... to prevent them from loosening. This will give you a much neater edge. Repeat steps 1-3 until you reached the desired length. 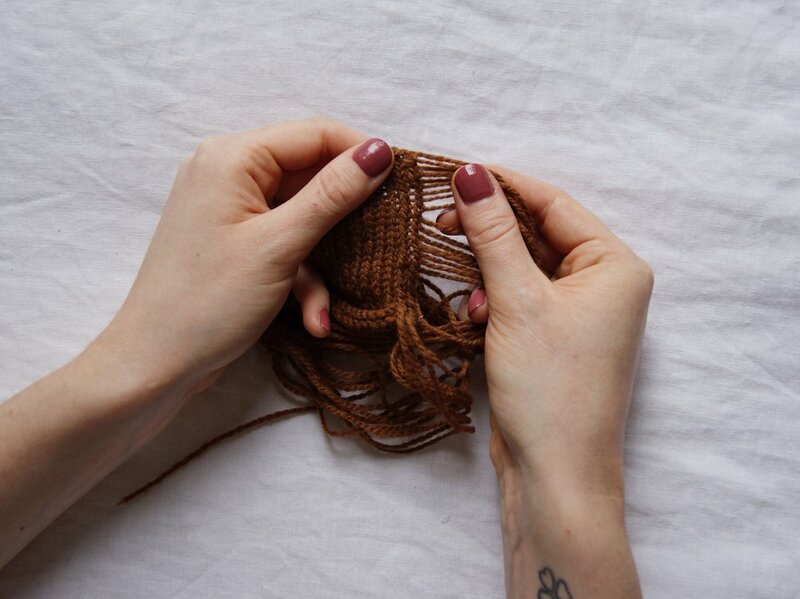 Give the loose strands a little tug, adjusting the tension on the first and last stitches. And you're done! Now it's time to cut the loose strands so your swatch can lay flat and you can block it easily. This is what your final swatch will lool like. 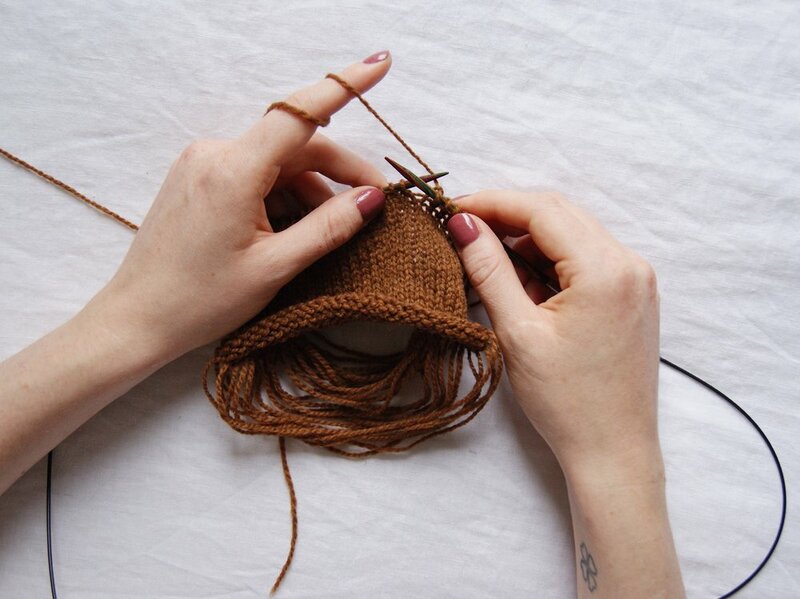 If you’re planning to unravel your swatch to reuse the yarn later, refrain from cutting the loops at the end. Just be extra careful when taking your swatch’s measurements as determining the correct number of stitches and rounds might be a bit more challenging that way!